Cigar Box Heroes: Happy Halloween, or The Headless Horseman rides again! Happy Halloween, or The Headless Horseman rides again! I have shared these pictures before, but it seemed an appropriate time to share them again! 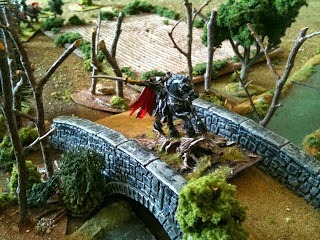 These are from a 28mm "Headless Horseman" skirmish / RPG game that I run on occasion. Great, imaginative figures from West Wind's Gothic Horror range. 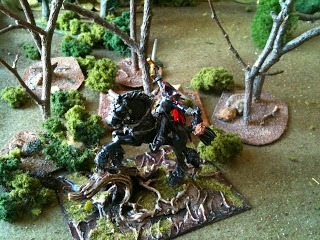 The Horseman seeks out his next victim! 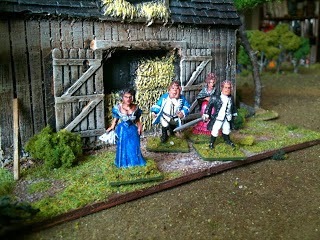 Some of the residents of Sleepy Hollow come outside to see what all the excitement is about. 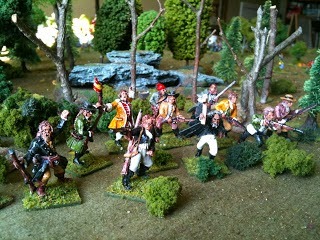 The Sleepy Hollow town militia head out into the woods to investigate. 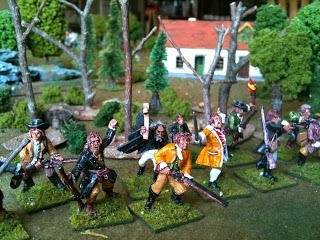 Another shot of the town militia. Beautiful pictures, figures and scenery! They look fabulous, sorry that I'm so late in finding them Cory! SO Cory what do you think of the new TV show "Sleepy Hollow"
I'm sorry to say I haven't watched it yet!